By providing circulating hot water at up to 200Â°F with heater output up to 275Â°F, Hydra Wagon (HW) 2016 preventsÂ liquids from gelling or freezing and becoming stuck in heat steam coiled rail tank cars in cold temperatures. 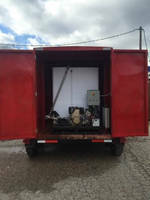 System is available onÂ skid andÂ in open or closed trailer. Weighing ~8,500 lb when loaded for operation, trailer-mounted systemÂ burns 6–7 gal of diesel per hour at high fire. Features include 600 gal reservoir and direct drive pump. Operator certificate is not required. The Hydra Wagon 2016 provides affordable solutions to quickly and efficiently heat steam coiled rail tank cars. ATLANTA – Hydra Wagon Industries, LLC unveils its latest product, the HydraWagon 2016 (video link), a portable heater for tank and rail cars. Steam coiled Rail Tank Cars carry the liquids civilization needs by rail, like blood through arteries. In cold temperatures, liquids gel or freeze and become "stuck" in the rail tank car. In most circumstances, the cars are steamed by injecting through the coils. Sometimes the steam is too hot and damages the contents and other times, steam is not available. For example, a manufacturer receiving four truckloads a month of a particular liquid, plastic or food may realize that switching to one rail tank car a month reduces shipping costs, exhaust fumes and provides the satisfaction of sufficient inventory. Purchasing a boiler and setting up a steam line represents a prohibitive capital expense. The new HydraWagon (HW) 2016 is ideal for light tank car users orphaned tank cars. HW 2016 heats over the road trailer tanks too. The HydraWagon 2016 provides circulating hot water at up to 200 degrees F with heater output up to 275 degrees F. It replaces the 150 & 200 models. HW 2016 is available on a skid, in an open trailer or a closed trailer. Hydra Wagon Industries, LLC President Michael Hoffman says: "This is the best HydraWagon so far. HW 2016 is built to run like the upper end 200 model and costs the same as the lower end 150 model. Relentless, incremental engineering improvements and smart vendors make the Hydra Wagon 2016 the best machine for the money in the world." A trailer mounted system weighs about 8,500 pounds when loaded for operation & burns 6-7 gallons of diesel per hour at high fire. Hot water flows in and out of the 600-gallon reservoir creating more efficient heat transfer by sparging the reservoir before circulating out. A direct drive pump takes the water from the tank and sends it coursing through the existing steam lines of a rail tanker providing heat transfer without thermal shock or scorching. Unlike most boilers, an operator certificate isn't needed for the Hydra Wagon 2016. It is a simple, sturdy machine with sub-components put together by top-notch craftsmen and "Made in the USA" that runs with minimal supervision. The Hydra Wagon executive team has over 100 years of combined business experience. We know about customer satisfaction and deliver customer satisfaction, every time. To learn more about the HydraWagon 2016, watch https://youtu.be/qvYiWNx6Mkw. To purchase or lease the HydraWagon 2016, visit http://hydrawagon.com/ or call (888) 694-9372 ext. 101. President - Hydra Wagon Industries, LLC.